The Four of Cups tarot card represents the time in the Minor Arcana when we turn our eye within. Sometimes this is out of dissatisfaction, not happy with what life has put in front of us. This has resulted in us walking the contemplative path of self-realization, seeking inner peace. Unfortunately, this can result in us not recognizing what’s right in front of us, and in fact cloistering ourselves off from what others are trying to offer us. The Four of Cups represents those times in our life when we have had enough. We’ve had enough of our struggles, of those who have caused them. We are a bit closed to what may be being right in front of us. This can lead to a sort of cautiousness, making us hesitant to accept new offers, which can be as much of a detriment as a benefit. Four of Cups upright stands for a time to reevaluate things and a prevailing sense of dissatisfaction. You need to find out ways to spice up things and make your life more interesting as you are bored with your mundane life. Remembering the unhappy experiences of the past will make you apathetic and sad. However, you need to shrug off this blanket of gloom tending to engulf you as there is a lot of happiness to be achieved. You simply need to focus and take the initiative rather than staying aloof in a world of your own. The past few months have seen you secluding yourself, physically and emotionally, from the world around you. It’s possible this has been out of a need for recovery and self-contemplation, but now my little naval gazer, it’s time to turn your eye without. The Four of Cups showing up in this position indicates that it’s time to turn your eye inward, take a little bit of peace away from the world. It’s going to be necessary to not shut yourself down too hard, lest you forget how to open up again, but for now a little self-contemplation is good. There will be a decision coming to you that will require some careful consideration. When it arrives rather than making an immediate decision. Take the time to reflect on the possible options and meanings. Do not reject the offer outright, but give it some time before accepting it. The Four of Cups reversed represents an opportunity coming, but one that will require a keen eye and determined action to obtain it. It’s likely sitting right in front of you, but if you don’t open up and speak your truth, you’ll find yourself missing out on something significant. If you’ve been feeling depressed or bored lately, you’ll be finding your way out of this in the near future. 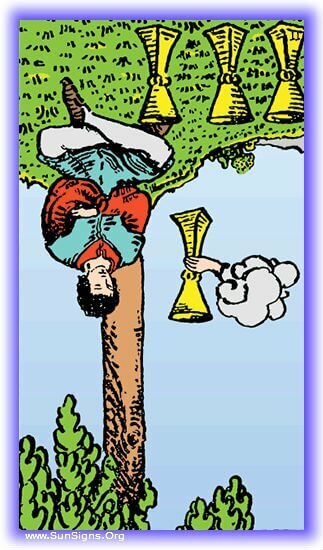 Four of Cups in the reversed position symbolizes a renewed dynamism, new ambitions, unions and opportunities. Fast changes would be occurring in your life which may make you anxious. Some new exciting events will bring happiness in your life. However, you may suffer from poor health or exhaustion due to over indulgence. Nevertheless, you tend to get bored very easily. So, you need to make a constant endeavor to keep things interesting and attractive. You are on the threshold of a new life. Don’t get tensed as you have all the qualities to adjust successfully to these new circumstances. An opportunity has recently come your way, and passed you by. Not having moved to jump on it has set this option moving on its way into the future. It may not be too late to grab it now, but it’s getting less and less likely. There’s an opportunity right in front of your eyes, and if you don’t open up your eyes and grab it, you’re going to miss it. Now isn’t the time for hesitation, or for being cautious, it’s time to put your heart on the line and open up. In the near future you’ll be finding this malaise you’re trapped in beginning to break away. It’s been a long cold winter for your creativity, and the Four of Cups tarot card will finally herald the breaking of the ice, and the waters of inspiration will flow again! Yes, grab this opportunity, it’s right there! Your ability to accomplish what you wish is within your reach!